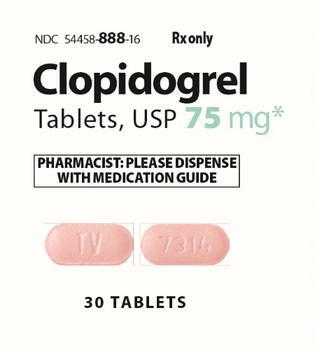 International Laboratories is recalling Lot# 117099A of clopidogrel Tablets, USP 75 mg, packaged in bottles of 30 tablets. While the product is labeled as clopidogrel tablets USP 75 mg, it may contain simvastatin tablets USP 10 mg. Missed doses of clopidogrel increases the risk of heart attack and stroke which can be life threatening. Additionally, unintentional consumption of simvastatin could include the common side effects associated with its use and may cause fetal harm when administered to a pregnant woman. Allergic reactions are also possible and could also be life threatening. No complaints of medical illnesses or harmful effects have been received. The recalled product was delivered to the distribution centers in Arkansas, Georgia, Indiana, California and Maryland, and shipped to retail stores nationwide. Customers who purchased the recalled product should stop using it and return it to the place of purchase or to Recall Coordinator 635 Vine St. Winston Salem, NC 27101 for a full refund. Consumers with questions may contact Inmar at 855-258-7280 Monday – Friday 9 AM – 5 PM (EST) or by email at internationallabs@inmar.com.